Skin cancer is the most common cancer diagnosed in the United States.1-4 This fact sheet presents statistics about skin cancer for New Hampshire and the United States as a whole. A Dermascan shows teens skin damage caused by tanning salons and the sun. tanning salons. The overarching goal of this project is to build grassroots, community systems that will bring about a sun safe environment and prevent/reduce skin cancer. 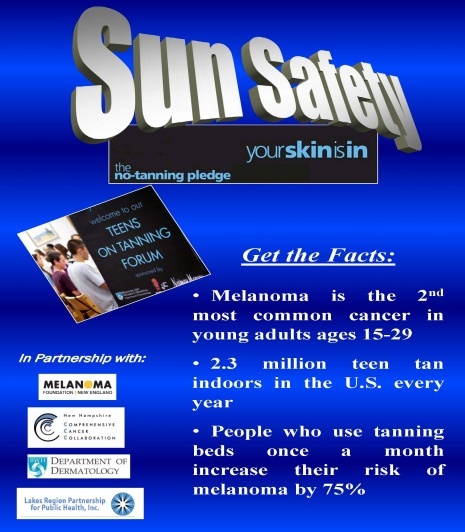 Provide education in Melanoma and sun safety to students in Franklin, Laconia, Meredith and Winnisquam High Schools. Recruit youth leaders and high school staff to engage students in advocating for "Your Skin Is-In", an evidenced based program to reduce tanning. For more information, please contact Lakes Region Partnership for Public Health at (603) 528-2145.